A Northeast Regional train skirts Long Island Sound before crossing the Niantic River over the Niantic River Bridge between East Lyme and Waterford, Conn.
During hot summer days, it’s hard not to think about a dip in the pool or a trip to the beach to enjoy the breeze off the ocean and the gently rolling surf. Along the Northeast Corridor (NEC), Amtrak customers catch glimpses of the placid Schuylkill River in Philadelphia and the fanciful buildings along Boathouse Row. 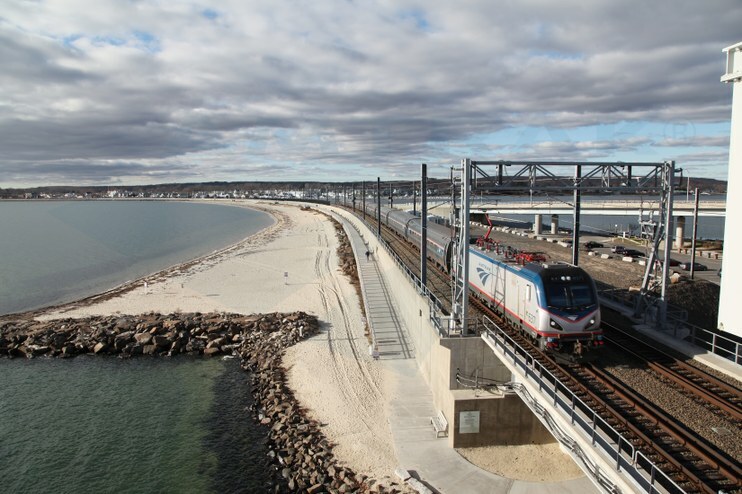 For stretches in Connecticut, trains skirt the edge of Long Island Sound, where you might spot children scampering across sandy beaches or see a variety of birds animating coastal wetlands. boat traffic. Image by Edmund Barrett / HAER. Sometimes trains come to a brief stop along the railroad in Connecticut as bridges open for boats headed for open waters or home port. 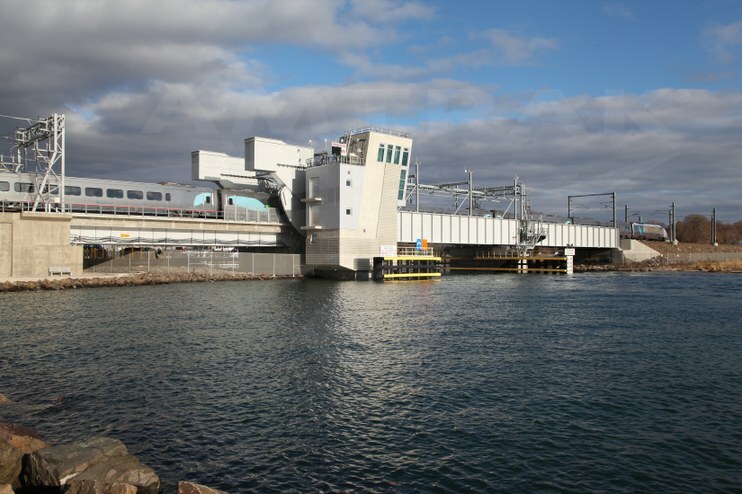 One of those movable bridges is located between the towns of East Lyme and Waterford, where the Niantic River meets the sound. Side by side, the tracks and Main Street make a gentle curve while crossing the river. On the south side of the tracks, a boardwalk and beach invite residents for a stroll along the water, while to the north busy marinas spread along the shore. The Niantic River Bridge is one of five movable bridges along the NEC between New Haven, Conn., and Boston. The current two-track, electrified railroad bascule bridge opened in 2012 and features one moveable span over the river channel. Acela Express and Northeast Regional trains travel it daily each way, along with Shore Line East commuter trains. 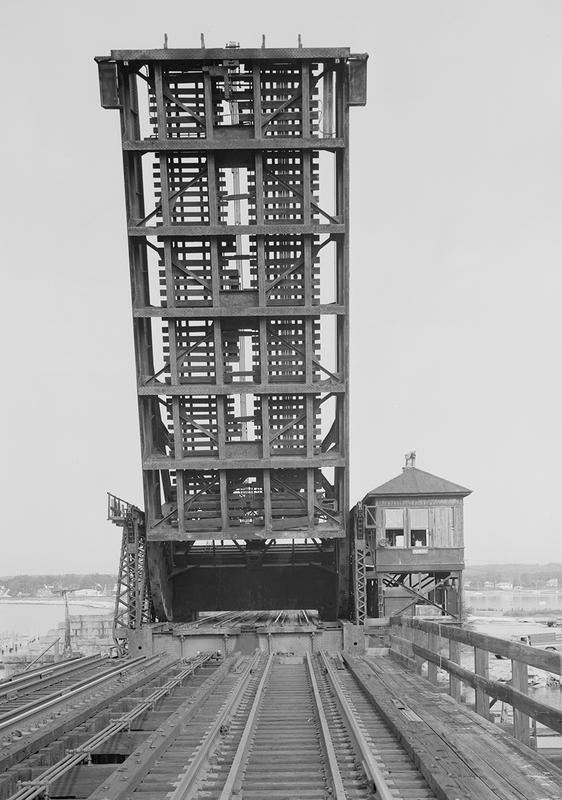 It replaced a 1907 iron bascule bridge built by the New York, New Haven and Hartford Railroad that had reached the end of its useful life. According to the Historic American Engineering Record, the 1907 structure was the third over the river in that approximate location. The new bridge allows Amtrak trains to travel at speeds of 60 miles per hour, up from 45 miles per hour. From a distance, you can make out the catenary poles and wires that carry the electric current to power the locomotives. 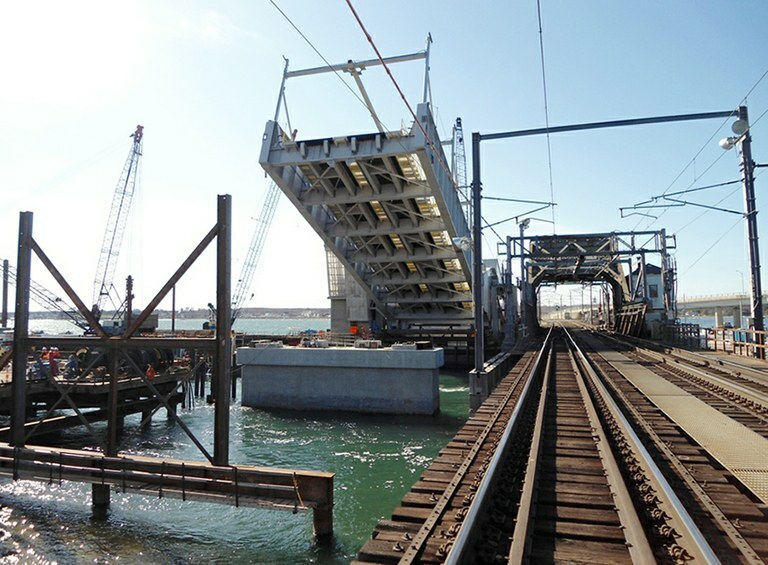 The current bridge under construction in 2012, with the 1907 bridge immediately to the right. The Amtrak Niantic River Bridge shown from afar as an Acela Express train passes over it. While the NEC between Washington and New Haven had been electrified by the 1930s, all-electric service on the remaining 157 miles north to Boston did not start until January 2000. Until that point, trains switched between diesel and electric locomotives at New Haven. 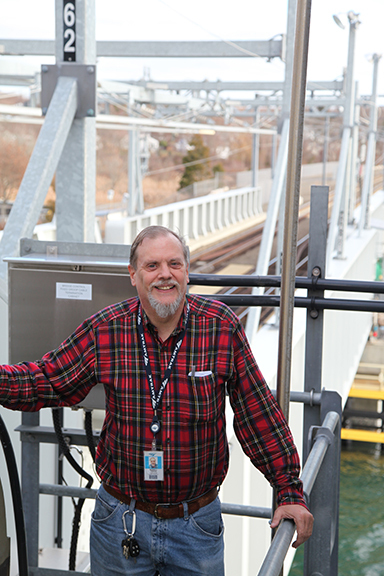 Merrill Perkins works as a Niantic River Bridge operator. Amtrak Bridge Operator Merrill Perkins usually arrives early for his 7 a.m. shift at the Niantic River Bridge. Perkins estimates that he opens the bridge between 15-18 times a day on average while on duty. During the summer, among the three shifts, the drawbridge can see as many as 1,000 openings per month. When a boat needs to pass through, Perkins communicates with its captain and the train dispatcher to prepare for the bridge’s opening, which takes approximately two minutes. Perkins’s interest in trains started at an early age, which then developed into a desire to have a career on the railroad. He started with Amtrak in 1976 as a laborer in a diesel shop. Through the years, he worked as a locomotive dispatcher and ticket agent before moving into his current position in April 2010. 1 “It’s official,” Amtrak Ink, March 1999 and “Amtrak launches first fully electrified service between N.Y., Boston,” Amtrak Ink, March 2000.